We always have guarded hopes with rental homes and this home thoroughly exceeded our expectations! The house is immaculately clean, in an awesome location and has tons of space. The communication with the management company was seamless (Kyle). We had zero issues and love the detailed instructions for everything. The beds are super comfortable and the living spaces are abundant. The yard was so nice and warm in the sun, even on cool days. I would recommend this house without hesitation. We had an awesome visit with our family (ages 6- 50's!). Location, location, location! (And space, space space!) Not only is "Park Place" super close to the the beach and town, but the family room is the size of a small house. Divided into three sections, it has a seating area around the fireplace, a bar table in the center, and a “man cave” area with dual leather recliners and swivel chairs facing a 75” TV. The dining table is set in a delightful glass-enclosed sunroom (seats 8), there’s a separate "breakfast nook" for cozy, intimate dining, and the fully-appointed kitchen has stainless appliances including a five-burner gas range. There are two bedrooms downstairs: one, with a Queen, has an en suite half bath, the other has two Twins, and there’s a hallway bath with a tub/shower. Upstairs, there’s another guest room with a Queen bed, and a hall bath with a toilet, vanity, walk-in shower and a washer/dryer (there’s another set in the two car garage). And last but not least, the master suite: a King bed, a balcony, and a private bath with a walk-in shower, jetted tub, two lav sinks, and a separate toilet compartment. Sitting area at the top of the stairs - perfect for reading or playing games. 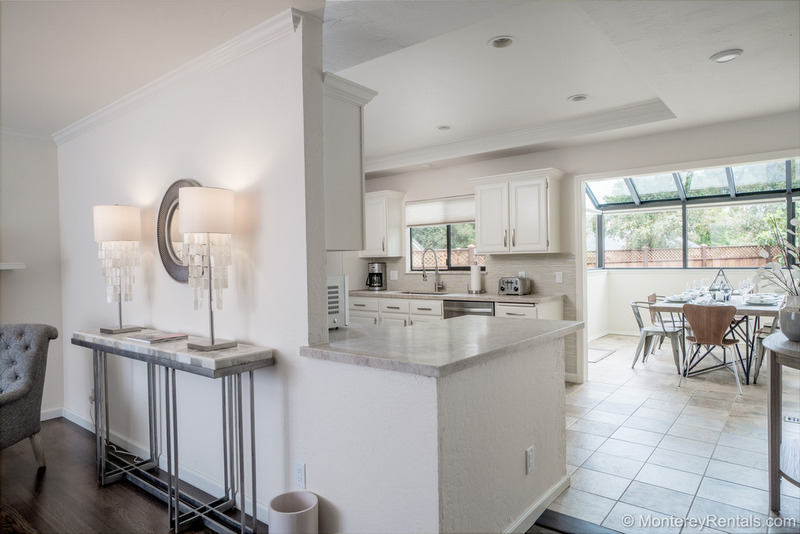 Gorgeous kitchen with stainless appliances and glass mosaic backsplash. Back patio has a new barbecue, and there's a second deck off the upstairs sitting area. Stunning master bath with walk in shower and jetted tub. Third guestroom downstairs has twin beds. Fourth guestroom downstairs has a Queen bed and an en suite half bath. Kyle at Monterey rentals was incredibly helpful when there was a small problem at the house. Communicated promptly, sent help to us and really went above and beyond. The house we rented was lovely and in good condition! We’d love to come back. Beautiful home. Plenty of room! Beautiful location. Quiet, quaint area. Only reason for four stars: not very kid friendly (specifically no outlet covers), no baby gate for stairs, and no A/C. However, box fans and ceiling fans helped with lack of A/C. Management easy to deal with. Convenient that office is just minutes away. We would stay here again when kids are older. Lovely, large home near Lover’s point. Wish we could have enjoyed it more as we were busy with wedding activities nearby so were not around to enjoy the backyard. The manager was very helpful and responsive; everything went smoothly. Big home in quiet beach community close to Monterey. Walk to beach and lunch on Main St five minute walk either directions, House was clean and well maintained. Great location for big family. Had a lovely weekend with extended family of nine with lots of elbow room and amenities. Particularly appreciated the convenient location to downtown Pacific Grove and Lover’s Point, and short distance to Cannery Row. The house was beautiful and we enjoyed the quiet neigborhood. We never cooked any meals but I did notice that the kitchen was well stocked. My sons and sister enjoyed the short walk to get their fancy coffee. I would suggest a TV in the living room. I didn't always want to go upstairs or watch TV from my bed. Having a crib or pack n play available would also be nice and not an expensive investment. wWe all enjoyed our stay at this lovely home and will return if we need to be in your area again. If you are looking for a beach house within walking distance to the beach, this is it! It is the perfect place for a large family (we are a family of 9). Everything from the kitchen, bedrooms and living spaces was perfect. We especially liked the dining area that is similar to a sun room, and the upstairs large living room. There is even another smaller living room that had a tranquil, beach house feel with surrounding windows. If that is not enough, most of the rooms have views of the ocean and you can see boats pass by in the distance. This house is the cleanest and most well-kept/maintained in the neighborhood of older two story homes and perfect in every way! Amazing and well worth the price. A very well appointed home, and at an amazing location. The house itself has a great backyard, the family room was perfect to hang out once the kids were in bed. A short walk to downtown for coffee, restaurants, and the beach right next door. I can definitely see us coming back again. Amazing House in Awesome Location! We were very pleased with our rental with Monterey Bay Property Management. Kyle communicated with me from the time I made the reservation so that I was well informed about the property and knew exactly where to go and what to expect. He met us with extra keys to allow different members of our family ( three generations, 8 persons) to explore Pacific Grove separate from the rest of us.The location was perfect--a quiet neighborhood with easy access to the water, to a playground for the 4-year-old to enjoy, opportunities to walk to Lighthouse Avenue and to the Butterfly Sanctuary (our 4-year-old did that, too). The house itself served us very well, with several places where we could gather, including outside, where one of our family did some work while the rest us were inside. When we arrived, the tables were beautifully set, welcoming us. We all agreed we would gladly stay there again.